So August 6th is an important day. Let’s just get this out there now at the outset of this post. Both of my grandmothers were born on August 6th, something I referenced five years ago. So I have a soft spot in my heart for August 6th. That’s pretty simple. So what took place today, on THIS August 6th? Celeste flew to Washington DC to hook up with her maternal grandmother. This is the first time the 15 year-old flew by herself and it took place on a flight in the United States. That’s no small thing. Chloe had her usual work day, the last before she and Alex leave for a road trip to southern California and back. That’s a big deal. Ella sent me, via text, that Bill Hader will be guest starring on Brooklyn 99 this fall. That’s exciting. And Melinda and Christine had pedicures, the first for Christine in her life. See, it’s a big day. On top of that, Bérnard sent me this picture and I think it’s swell. 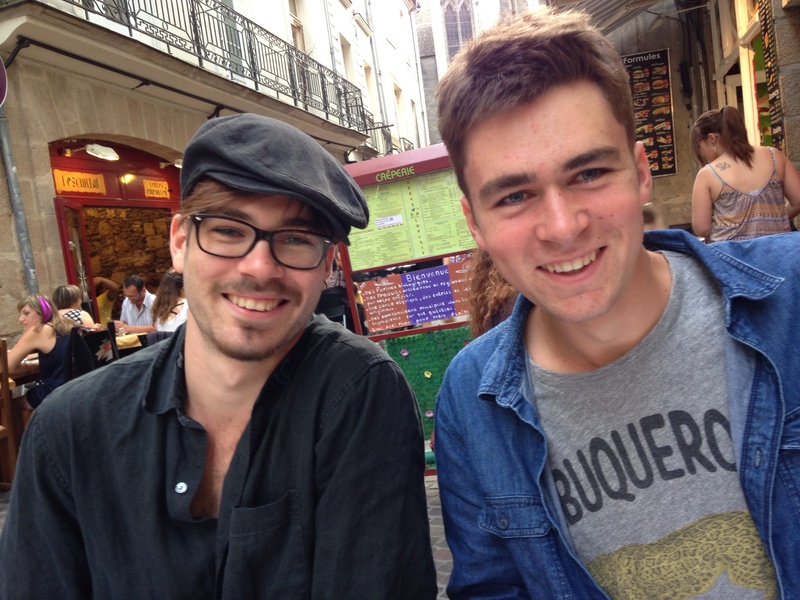 Max and Théophile, Celeste’s older brothers, in Nantes. Max, you are looking fine. August 6th. A good day.